Improving sales and getting better revenue is what every entrepreneur – be it a start-up or a well-established business – dreams of. Naturally, looking at optimizing the sales funnel is what everyone looks at. However, there may be something else as well – a crucial aspect that might have been overlooked by many entrepreneurs. 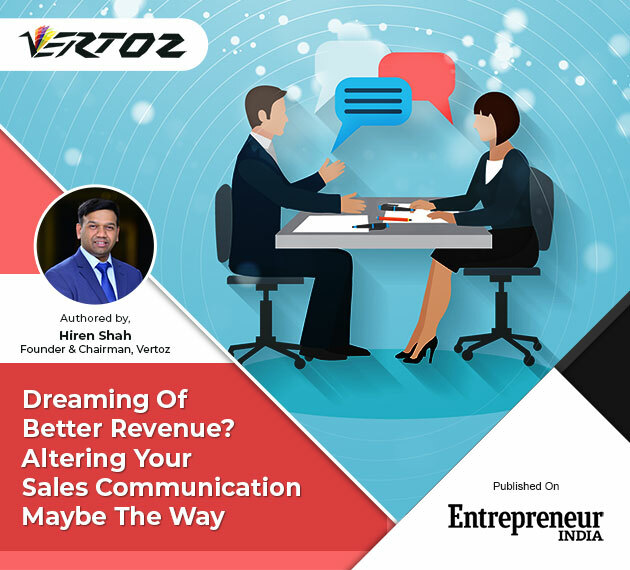 Vertoz’s Founder and Chairman Hiren Shah unveils this important aspect in his fortnightly column in Entrepreneur India. This pivotal aspect, which can totally transform the revenues is how brands talk to their consumers and communicate about their product. Buyers at always at the top of the chain. Therefore, brands need to change the way they present themselves and their products. They have to take a buyer-centric approach, instead of a vendor-centric approach. Marketers need to illustrate how they are solving the problems of their customers and how their product is going to making their customers’ lives easier. That’s how they will connect better with the product and find value in the brand’s offerings. It zeroes down to the “features v/s benefits” discussion. If one keeps on explaining the technicalities of the product without touching upon how exactly will they help to transform the user’s life then there will be a lack of motivation to buy the product. Also, communication needs to be different for customers having different pain points. Marketers should highlight a different benefit for different customers according to what really matters to them, and then support it with the features.